Listed below is a list of the various team members along with a brief description and history. The Battlespire development team with numbers to indicate who they are (See below). NOTE: This is only a small group shot of part of the team. Mark is a long time freelance artist for the Elder Scrolls series who worked on Morrowind among other games. Mark has done work on every ES game up until Morrowind. He also worked on SkyNET and created the first Scamps. Father of the Elder Scrolls: Julian is no longer working for Bethesda, but rumors have it that he was involved in the design phase of the game and did some contract design and programming. Also known as simply GT or WormGod, GT is once again working on the graphics for Morrowind, among other things. GT was also involved with Redguard and Battlespire (graphics and level design). 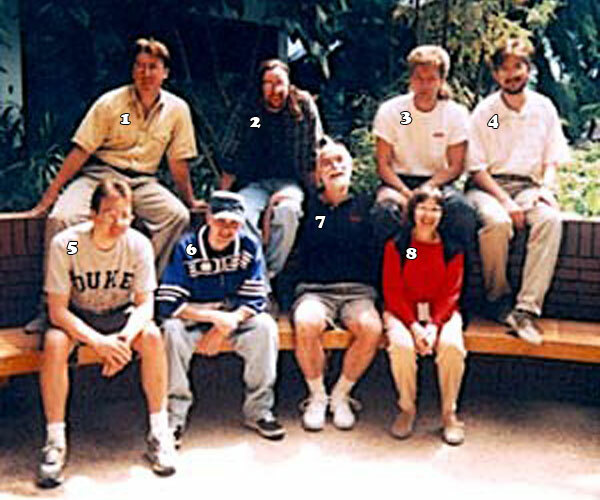 Ken is the lead designer for Morrowind and was involved in creation of Redguard. He is one of the fathers of role-playing and has done work for almost every paper system out there. Ken left Bethesda after Oblivion's release.